I post a job that I a need filled for my client and a candidate sends me their resume because they are interested in the job. I call the candidate and go over their work history, what they are looking for in their next position, and explain how we can be a free added source in their job search. If I feel we can assist them, I add them to my calendar for an in-person interview. After we hang up the phone, I complete all the data entry from our call, send the candidate the application and some general testing to complete prior to our meeting, as well as send a follow-up email with my information and confirmation of our interview. The next day is here and I have allotted one hour to meet with this candidate. I check to see if their application and testing are complete and then send them a confirmation text for our interview. Sometimes I hear back and sometimes I don’t. (Pretty convenient we can text someone and they can actually reply back-that’s the 21st century for you!) Their interview time rolls around and I do not see or hear from them. Big sigh! I spent nearly 10 minutes on the initial call with them and then a few extra minutes after that sending them some items to complete. I usually wait about 20 minutes or so after our scheduled time to meet before I call the candidate. It’s a courtesy call more than anything. Are you OK? Did you get lost? Most of the time they do not answer. Now they are considered a No Show. A “No-Call No-Show” isn’t good for your record. Why? Well, it says you agreed to meet at a certain time on a certain day and never called to cancel or reschedule. If something came up, just give me a call. Life happens! I get it. If you decided you didn’t want to meet after all, just let me know. I do not need a reason, but calling (or emailing or even texting) and saying you want to cancel the interview is much better than a no-call no-show. If you call prior to the scheduled time and say you want to reschedule then it increases your chance of me opening up my calendar to meet with you again. There are so many times that a candidate will call back and want to schedule a time to interview, but they have not shown up to previous interviews and that makes it hard for me to reschedule. After all, I did take nearly 15 minutes out of my day to schedule your time and then blocked out an hour days after to meet with you and I never heard from you. We all know that it still may happen again, however, if we let the candidate know up front that if something comes up and they need to cancel or reschedule, just call us. It will definitely set the expectation up front. It could go like this, “Mr. Candidate, I appreciate your time speaking with me today. I have you on my calendar for tomorrow at 11:00 AM. If at any time you decide you no longer want to pursue this opportunity for an interview, will you just give me a call and let me know? I have several others in addition to myself who are taking time out of their schedule to meet with you and I owe it to them as well as myself to give them back the time.” We assume every person, no matter the tenure or their experience, will be courteous and call to cancel, but they don’t. Just know that if you cancel or reschedule instead of no-call no-show, your chances of being looked at again for consideration are much higher. Amber Oliver joined Celebrity Staff in 2015 as a Recruiter servicing the Kansas City market. 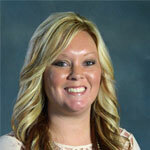 Prior to joining the Celebrity Staff team, she worked as a Staffing Manager for another staffing agency. Amber comes with a total of eight years recruiting experience and is as an expert in sourcing, screening, interviewing, evaluating, testing, placing, and completing all on-boarding processes for candidates. Her co-workers describe her as spunky, outgoing, and willing to help out wherever needed. In her spare time, Amber enjoys spending time on the farm with her significant other, step-son, sister, and nephews.